Clover Sonoma products start from milk sourced from a large group of family run dairy farms located in Marin, Sonoma and Mendocino counties. The dairy farmers on these spacious regional ranches practice methods of sustainable agriculture and have an extraordinary commitment to animal welfare with no 'feedlot' living. In addition, the farmers do not use rBST, the genetically engineered cattle growth hormone that stimulates milk production. To this effect, the American Humane Association has recognized Clover diary for humanely produced diary products. 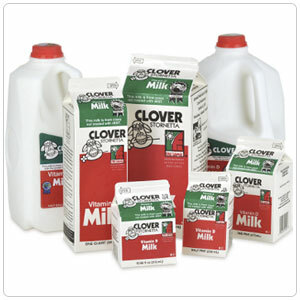 The Clover dairy brand began in the early 1900’s when the Petaluma Cooperative Creamery began distribution in Sonoma and Marin counties. A large fire destroyed the Petaluma plant in 1975 and the company re-emerged as Clover-Stornetta in 1977 and opened a new state-of-the-art facility in 1991 and has steadily increased distribution throughout California.